pointing to help him communicate with others. The woman admitted she drank, smoked cigarettes and used drugs, each known to harm babies. Wolfley and her husband, Ted, were expecting the next stage in their lives to be an empty nest, not starting over with a new baby. Jen, now 46, and Ted, 52, already had four children between them, including from prior marriages. Their youngest was 14, so the couple was long past changing diapers. The baby was likely to have disabilities. But Jen thought about the prostitute's difficult life and of her own bad childhood. Jen's mother abandoned the family when Jen was 6. Her father died of cancer when she was 9. She also suffered sexual abuse by someone who was supposed to be caring for her. "Maybe there's a reason for all of this," she thought. "Life has to get the last word." She imagined the baby would otherwise end up in foster care, which isn't always loving or lasting. Jen learned through her work with people in and out of jail that many had been in foster care or otherwise had unstable childhoods. As an adjunct professor of English and criminal justice at Rochester Institute of Technology, Jen has taught about families in Great Britain taking in refugee Jewish children from Nazi Germany. 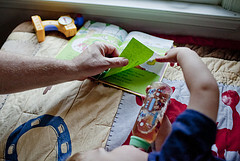 The British foster parents understood what it was to love someone else's children, Jen says. "There's a saying in the Bible: If you save one life, you've saved the world," said Jen. So she said yes, even before consulting her husband. He laughs about that. "Jen came home and said we're getting a baby," Ted recalls. The easy-going computer programmer agreed with the decision and wasn't shocked. Jen had previously brought home mistreated dogs as well as women who needed a bath or temporary lodging. Ted before bed and always helps turn the pages. They renamed the baby Sergei and also call him "Serge." He was born early and came to live with them at three weeks, after legal guardianship was granted. He weighed about 5 pounds. He had breathing difficulties, a bag of medications and a list of doctor's appointments. 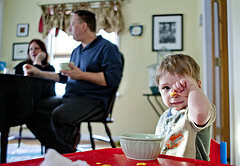 His tiny body shook from his birth mother's drug use and he had trouble keeping formula down. "He was rigid and stiff," Jen says. "He just wasn't responding." They held him often anyway. The family ? including son TJ, now 17 ? made financial, physical and emotional sacrifices to meet Sergei's needs. They moved from Brockport to Brighton to be closer to medical care after a scary asthma attack. Jen gave up her beloved street mission job as director of Grace Urban Ministries' Mary Magdalene Women's Outreach Center. Sergei has been diagnosed with fetal alcohol spectrum disorder and has certain delays and challenges. He receives speech, occupational and physical therapy. He uses some sign language and pointing to communicate, since his speech is limited. Sergei at times gets upset for no clear reason, suddenly complaining, crying or banging toys. His parents either let him vent or suggest a "pouch on the couch" ? wrapping him in a blanket and perhaps rubbing his feet to help him calm down. Sergei, who turned 3 on Sunday, has come a long way. He laughs, likes to be held and enjoys active play such as jumping on a trampoline and swimming. He notices a pillow out of place or piece of trash on the ground and puts things right. "He likes to hold your hand and sit on your lap and read books," says Tabitha Maier, 22, Jen's daughter. "He is the sweetest little guy." Sergei loves to follow his dad around, using his own tools to mimic fix-it projects. The Wolfleys have invited his birth mother to birthday and holiday gatherings when they can reach her and as long as she's sober. Sunday she met up with them briefly at a McDonald's restaurant play room. The 29-year-old arrived in pigtails and a midriff-baring puckered pink shirt, snug pants and fishnet stockings. She darted back and forth along the play structure to smile and wave as the 3-year-old climbed through plastic tunnels and appeared at different windows. She gave him a kiss and wished him a happy birthday, moving nearly constantly in the jittery way of a drug user who hasn't used recently. Jen and the birth mother hugged and cried before the birth mother walked out to rejoin a man in a waiting car. Rabbi Philip R. Goldstein, a chaplain at the Monroe County Correctional Facility in Brighton, who knows the Wolfleys and Sergei's birth mother, spoke at the court hearing to finalize the adoption. He calls the adoption a blessing, something to celebrate in a world that has plenty of evil. "If we look, there's plenty of good out there," says Goldstein. He says the Wolfleys exemplify a great love of humanity. Donna Ehrhart, a friend, sees that the experienced parents are confident and intentional about how they're raising Sergei: "He probably is much further along in his life than he would have been without Ted and Jen." 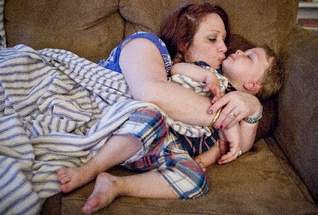 Ehrhart has met the boy's birth mother and respects the decision she made and that she has stuck with it: "She's not able to even help herself." The Wolfleys find parenting more exhausting this time around and trade off taking naps. Ted, whose oldest sons are 32 and 30, says he's more calm and patient than as a young father and it helps to be more financially comfortable. Jen says they once chased the American dream of moving up and acquiring things. In midlife, after losing some loved ones, they see success differently. More important, says Jen, are the people in your life whom you could call at life's worst moments. "That's where your trust fund is." They have a new understanding of special needs and of not judging strangers whose children are behaving oddly. Jen gets frustrated by society's disposable attitude of getting rid of things that aren't perfect. She cited the Tennessee woman who adopted a boy last year from Russia but sent him back on a plane in April, alone, with a note saying the 7-year-old was violent and mentally unstable. "Every life is very important," says Jen. She doesn't wish that Sergei was free of limitations because that would be saying he's not good enough as he is. She thinks of Hitler, who killed the people he didn't want in his idea of a perfect world. "You have to be able to appreciate imperfections," Jen said. Ted says the most difficult part of adding Sergei to their family was dealing with the bureaucracy of the foster care system up until July when the adoption was final. For example, parent-reunification rules required that they take Sergei for multiple meetings with his birth mother ? even though she said she wouldn't attend and she didn't. On the plus side, the county paid the court costs for the adoption and lined up financial help to care for Sergei. Kelly Reed, Monroe County's commissioner of human services, agrees the process can be arduous but says it is designed to protect everyone's rights, including the birth mother's. Jen thinks of Sergei's birth mother as another child, about whom she worries often and who she hopes can recover from her addiction and other challenges. "She did the right thing" in loving Sergei so much that she could give him to a stable family, Jen says. "I don't know if I could do it." he was born, i felt like my feet left the ground."